Double Thick Chip Brushes with 100% natural bristles are twice as thick as regular chip brushes. Perfect for epoxy and polyester resins, bottom paint, and industrial coatings. Double thick chip brushes are twice as thick as a regular chip brush to hold more paint and produce a more even and smooth finish. Brushes are used for many tasks, chip removal, painting, parts cleaning, fiberglass prep. The brushes are nice and thick and used over and over after cleaning. For painting remove loose bristles. I like them and will recommend them. cheap, perfect for bottom paint. 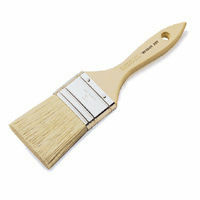 this is a great bottom paint brush. Use it once and toss it. Not a horrible brush, but pretty quick to loose its bristles. Spent most of the time trying to pull the bristles out of the epoxy.